For over 30 years, CNOR has been the gold standard in recognizing registered nurses who possess the specialized knowledge and skills required to provide the highest quality of care in all aspects of patient care before, during, and after surgery. Current accreditation by the ABSNC (American Board for Specialty Nursing Certification) and the NCCA (National Commission for Certifying Agencies) indicates that the CNOR certification program has met the highest certification standards in the medical industry. CNOR credentialing sets you apart as a registered nurse with the knowledge, skills, and commitment to providing the best care for surgical patients. Eligibility requirements to apply for the CNOR exam include: current RN license (unrestricted), current full-time or part-time employment in perioperative nursing (clinical practice, research, administration, or nursing education), and perioperative nursing experience of at least 2 years and 2,400 hours (a minimum of 50% or 1,200 hours must be in the intraoperative setting). Your clinical experience and excellent study materials is the key to success in taking the CNOR exam. Mometrix, the world’s #1 test preparation company, has the study materials you need to adequately prepare for this important exam. The CNOR exam is a computer-based test consisting of 200 multiple choice questions. Each question will have four possible answers and there is only one correct answer. All questions should be answered. If you are unsure of the answer, you can indicate that this is a question you want to return to later. To complete the exam in the allowed time of 3 hours and 45 minutes, each candidate will need to spend approximately one minute on each question. Before starting the CNOR exam, you have the option of taking a 15 minute tutorial which will familiarize you with how to navigate through the test. All candidates are encouraged to take the tutorial. Upon completion of the exam, there is a short survey. The survey questions do not affect your test results. Once you have finished the survey, you will receive your test results indicating if you passed or did not pass. The current passing score is 620. All CNOR exams are administered by Prometric. Candidates desiring to sit for the CNOR exam will need to submit an application at www.prometric.com. Prometric testing centers are located all over the country and tests are scheduled Monday through Saturday, except holidays. What is the CNOR certification? The CNOR certification is a certification for perioperative registered nurses. This certification proves that CNOR certified nurses are committed to providing quality care to their surgical patients. How much does it cost to take the CNOR? The cost to take the CNOR exam is $395. If you need to, or choose to, retake the CNOR exam after the first initial test, the cost for retesting is $445. How do you become CNOR certified? To become CNOR certified, you must have a current RN license and be currently working either full or part time in periperative nursing as well as having completed at least 2 years and 2,400 hours of experience in periopertive nursing with 1,200 hours in the intraoperative setting. What is the CNOR exam? The CNOR exam covers nine different subject areas including Preoperative Patient Assessment and Diagnosis, Perioperative Plan of Care, Intraoperative Care, Communication, Transfer of Care, Instrument Processing and Supply Management, Emergency Situations, Management of Personnel, Services, and Materials, and Professional Accountability. Is the CNOR exam all multiple choice? The CNOR exam is all multiple choice. The exam contains 200 multiple-choice questions. Each question has four answer options. How long do you have to take the CNOR? The CNOR exam is timed for 3 hours and 45 minutes. How do you sign up for the CNOR exam? To sign up for the CNOR, you will first need to fill out your application. Once your application has been approved, you will need to locate a testing center and schedule the time for your exam. What is the pass rate for the CNOR? The passing rate for the CNOR exam is 70%. What is a passing score for the CNOR exam? The CNOR exam is scored on a standardized scaled score. The passing score for the CNOR exam is 620. The Preoperative Patient Assessment and Diagnosis subject area includes: patient health assessments, medication reviews, the Joint Commission’s Universal Protocol, surgical consent, advance directives, patient rights, pain assessment, and development of nursing diagnoses. The Perioperative Plan of Care subject area covers topics such as development of measurable patient outcomes, development of individualized care plans, and incorporation of patient education into the patient’s care plan. The Intraoperative Care subject domain consists of patient education of the surgical area, safe medication administration practices, safe patient positioning, surgical site care, asepsis principles, perioperative care during procedures, identification and control of environmental factors, reducing the risk of complications, preparation and labeling of specimens, performing counts, and maintaining accurate records. The Communication subject area covers the importance of effective verbal, nonverbal, and written communication including but not limited to hand-off’s, SBAR, Universal Protocol, WHO checklist, HIPAA, National Patient Safety Goals, PNDS, and The Joint Commission. The Transfer of Care subject domain covers subjects such as transferring of patient care to other team members and planning for the discharge of patients from the facility. The Instrument Processing and Supply Management subject area includes questions about principles of infection control, chemical and biological monitoring principles, best practices in the safe handling of hazardous and bio-hazardous materials, and the proper cleaning, disinfecting, packaging, sterilization, transportation, and storage of instruments and supplies. The Emergency Situations subject domain consists of questions regarding personal physical complications such as anaphylaxis, cardiovascular emergencies, respiratory complications, and malignant hyperthermia. This domain also includes trauma, fire, mass casualties, terrorism and natural disasters. The Management of Personnel, Services, and Materials subject area includes all aspects of managing an interdisciplinary team and ancillary personnel, product evaluation and selection, supply management, cost containment, and environmental consciousness. The Professional Accountability subject domain contains questions such as best practices, regulations, healthy work environment, workplace improvements, quality assurance, patient advocacy, continuing education, professional growth, ethics, and professional standards. With an average pass rate of approximately 70%, you want to prepare adequately so that you will be successful the first time you take the CNOR exam. Mometrix has developed all the study materials you need. The CNOR Exam Secrets Study Guide developed by our test experts includes the specific content and skills that you must know to achieve success the first time. 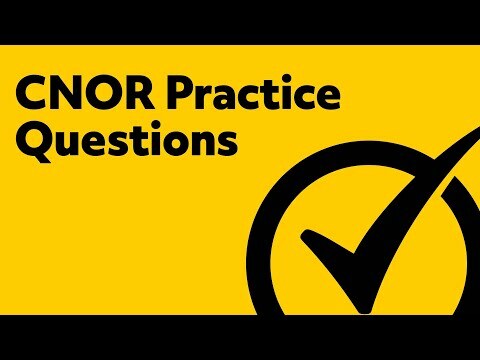 Our CNOR study guide includes practice test questions so you can determine if you are ready for the CNOR exam or if you need to review the material again. The practice questions include detailed explanations so you can not only know the correct answer but why it is the correct answer. The Mometrix CNOR study guide also provides important test taking tips. 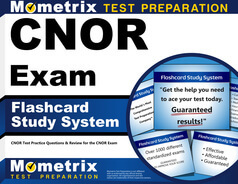 Mometrix also offers the Mometrix CNOR Exam Flashcards. Studies have shown that repetition is the most effective form of learning which makes flashcards a great test preparation tool. Our test researchers have taken the critical concepts you must know for the CNOR and put them on professional quality flashcards providing you with an easy-to-use learning method. These flashcards also include practice test questions and study tips. Because we are so confident that these study materials will help you achieve success on the CNOR exam, the CNOR study guide and the CNOR flashcards come with a risk-free, 1-year 100% money-back guarantee so you have nothing to lose. Order the Mometrix CNOR Exam Secrets Study Guide and/or the Mometrix CNOR Exam Flashcards today and take the next step in advancing your nursing career. Mometrix Academy is a completely free CNOR certification resource provided by Mometrix Test Preparation. If you find benefit from our efforts here, check out our premium quality CNOR study guide to take your studying to the next level. 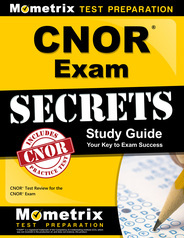 Just click the CNOR Exam Secrets Study Guide link below. Your purchase also helps us make even more great, free CNOR prep content for test-takers. Our customers love the tutorial videos from Mometrix Academy that we have incorporated into our CNOR test study guide. The CNOR study guide reviews below are examples of customer experiences. This was a wonderful book. It helped me prepare for the test I was already stressed about. It is easy to read and gave explanations to help you understand better. Best buy. Anyone taking there CNOR exam, I would invest in this book!! I compliment the layout of the book with each area separated with bullet points. It’s simple, factual and has prepared me for some areas I have not thought about in awhile. The testing tips on reading the questions and when not sure, to review each answer was helpful. I also found the prefixes, suffixes can and will help when stuck on a question. Basically the book helps you slow your brain down and help you think through every question logically. So far so good! Love the book. I plan to take my CNOR exam this spring and think this book has given me the confidence I need to take the exam. I like the layout of the book with review information then test questions, followed by the answers and explanations. I think the product gives a great overview of the material that needs to be mastered for the CNOR exam. I like that the book is broken down into different sections. One section focuses on presenting the material, while another section focuses on practice questions. This will definitely help me prepare for the types of material and questions I will likely see on the CNOR exam. Needed this book ASAP and it was delivered ASAP. It is a wonderful review that sparks you to also look up other needed tidbits. Having the exam in the book was a much needed piece to give an idea of the real exam. Highly recommend this book! I like how it breaks down the information into sections. For example, it takes you through prep-operative and teaches you all you need to know and all that needs to be done before going to the operating room. Then, I like how it flows into intraoperative, teaching you everything you need to be a competent, knowledgeable, and successful operating room nurse. The material is very detailed, to the point, and easy to follow. I really liked the length of this study guide. IT was long enough where I felt good about covering enough material before the test, but not too long where I was feeling overwhelmed by not possibly being able to cover it all. Overall, a really great study guide!! The material is presented in an organized fashion along with ideas of how to study for this big exam. I have taken the test once before and was unsuccessful. I researched the ratings of this study guide and they were very high. I also like the many practice questions in the back of the book. This study book has been great with helping me prepare for my exam and teaches without being too overwhelming and is very understandable.